As an additional cost to play this operation, spend clickclick. Gain 10credit and draw 4 cards. You may install 1 card. "If there were hidden partitions on the server, I'd know; I'm the head of this department!" Ultraviolet Clearance has set itself up as the big brother of the "clearences" family, topping Green, Blue and even Violet (Black is kind of an odd one let's say). It goes along the tradition oc combining drawing and gaining money with a better click efficiency than if you would do it mannually but also with a relative clumsyness. In detail, Ultraviolet Clearance gives you 4 credits, 4 draws and 1 instal for 3 clicks. That is a ratio of 3 actions per click. It can seem nice but it is the same as being forced to play Beanstalk Royalties , Anonymous Tip and a weird combination of Lateral Growth and Green Level Clearance, always together as your whole turn. That is clumsy, all the more that you will have to draw 4 cards with your only possible reaction being to install one of them. The flood can become real very fast. However, despite this relative clumsyness, this card may be interesting in combination with two others. 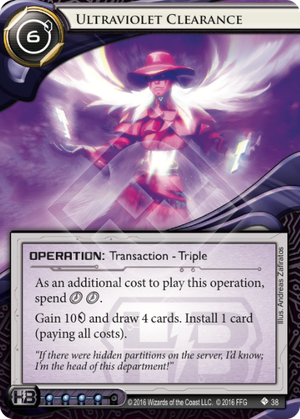 The most obvious is Cerebral Imaging: Infinite Frontiers: you can spend one turn getting your hand and your hand size bigger while installing one piece of your combo. That's... fine I guess? I'm not enough of a CI player to say. However, were I think this card can really shine is in combination with our beloved Bryan Stinson. Bryan on his own has a lot of problems and he will not always work out the way you hope he will. But having an Ultraviolet Clearance in the bin and a face-down card can send the message to your opponent: "finish your turn with less than 6 credits and I will get all the cards I need and more money you can count in just a click". That's pressure, especially in the early game. That is also a way of widening scoring windows and capitalising of possible runner hailmary. In combination with Blue Level Clearance and Lateral Growth Stynson can bring a new wind to HB rush decks, able to set up incredibly fast except if... the other is not ready to get down in credits and thus let us rush! That is not Tier 1 talking as I can't call myself a Tier 1 player but this card for sure enable funny daring decks and I advise you to give it a try !